Metatrol.com | What Is the Difference Between Avémar and FWGE? Fermented wheat germ extract (FWGE) is the active material or ingredient in Avémar. Avémar is a 17g per day dose. Avémar, sometimes mistakenly spelled as “Abemar” or “abenar,” has 8.5g of fructose, 3g of maltodextrin and 5.5g of FWGE. By contrast, AvéULTRA, sometimes mistakenly spelled as “AbeULTRA,” is 5.62g daily dose of 5.5g of FWGE, .1g of orange flavor and .02g of stevia. It has a low glycemic load due to zero added sugar; in addition to a low moisture, hydroscopic mix. All-natural, zero calorie stevia acts as the sweetening agent instead of sugar. Once-a-day use of AvéULTRA delivers 5.5 grams of freeze-dried FWGE actives. We created AvéULTRA to make FWGE more accessible to take for consumers, as the orange flavor and stevia make the drink mix more palatable. We then improved upon FWGE by creating fermented wheat germ extract – super concentrate. 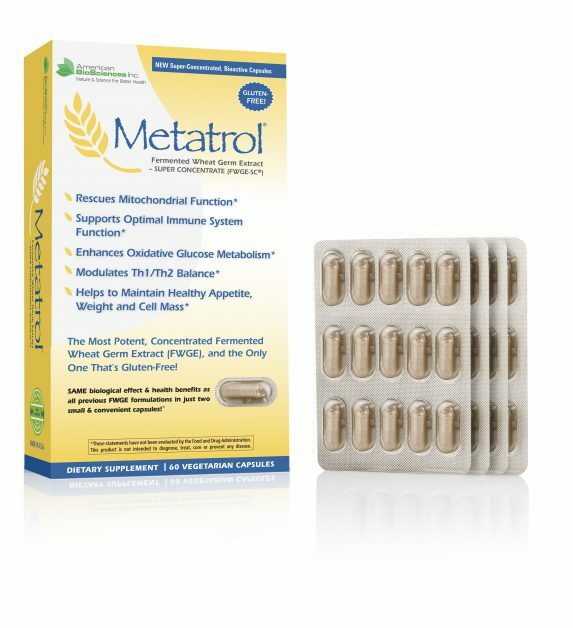 Metatrol: FWGE-SC comes in a gluten-free capsule. There is neither also no orange flavor nor stevia in Metatrol. Unlike AvéULTRA, Metatrol is stable at higher temperatures, which makes it cheaper to ship worldwide and it can be stored in the pantry instead of your refrigerator. Rigorous scientific studies confirm that 41 mg of FWGE-SC, found in 2 capsules of Metatrol, has the same biological activity as 1 packet of AvéULTRA.